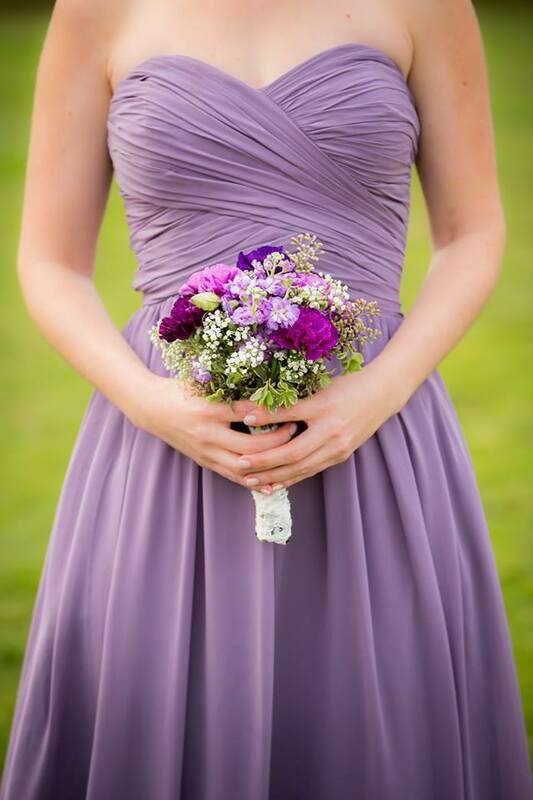 Heather contacted me just last week about flowers for her wedding. 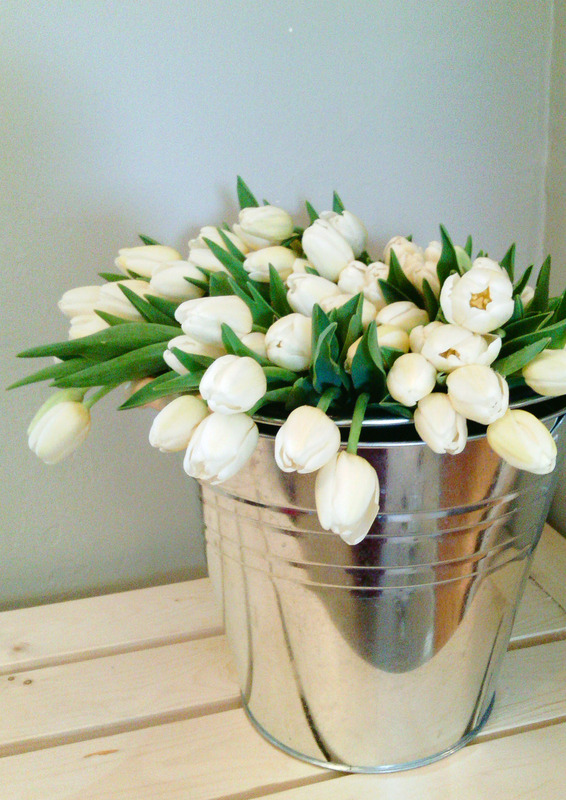 She told me she loves tulips and that her wedding colours were ivory, deep green and grey. 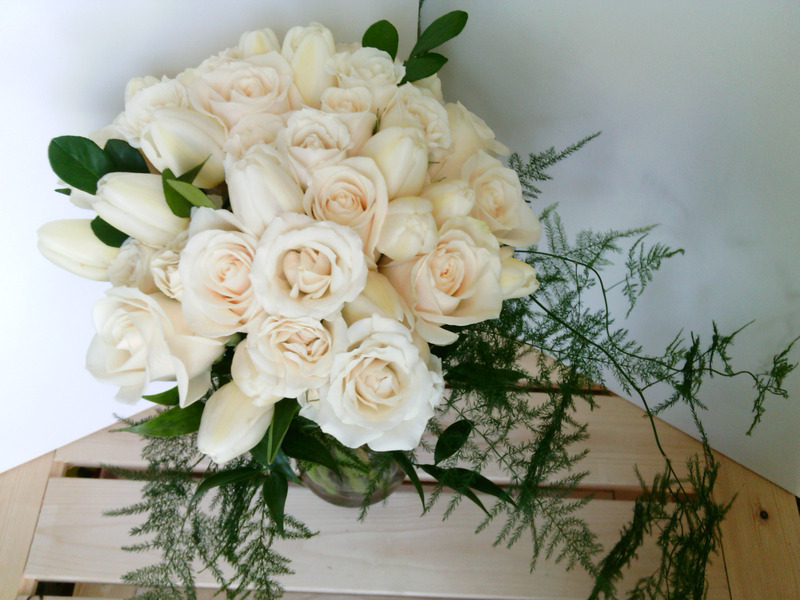 For her bouquet I used white tulips with a mix of ivory candy scented roses and created a mock-cascade with trailing asparagus plumosa foliage. 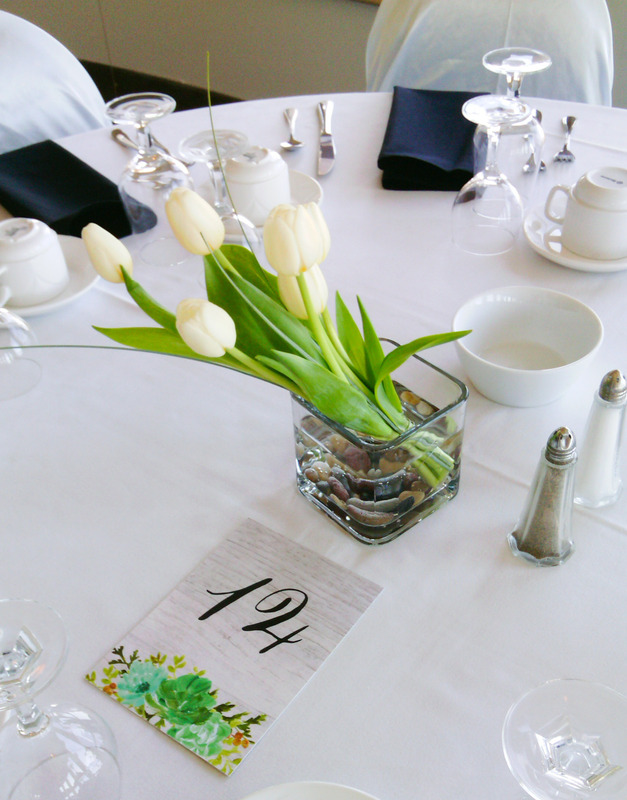 Using white tulips, she asked me to create something simplistic for her centrepieces. 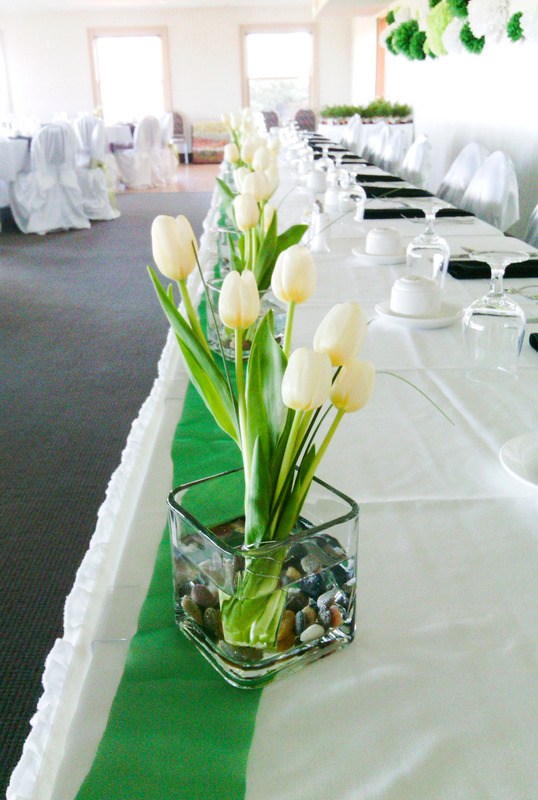 I decided to create asymmetrical arrangements by layering tulips, which created a little more movement and flow in the centrepieces. 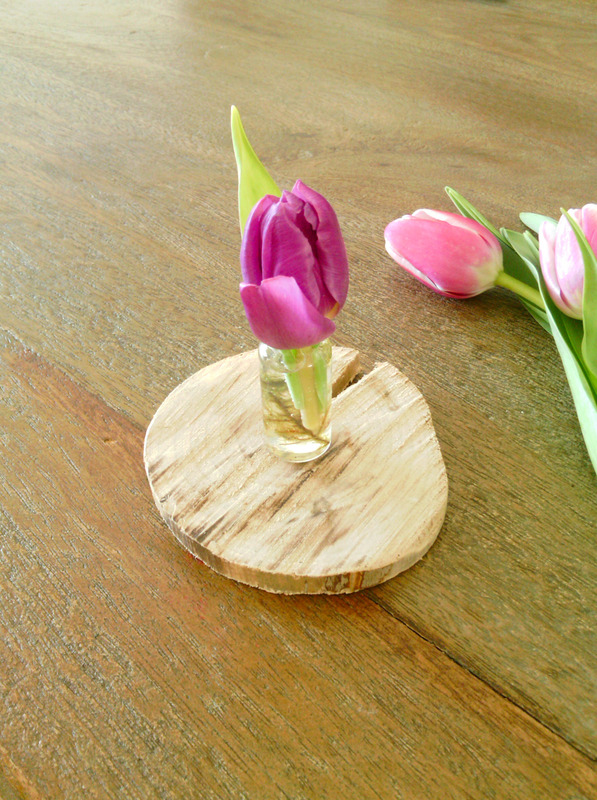 As a little thank-you, I found a large rectangle vase in my studio, and with some remaining white tulips and foliage, I made a larger scale version of the centrepieces. 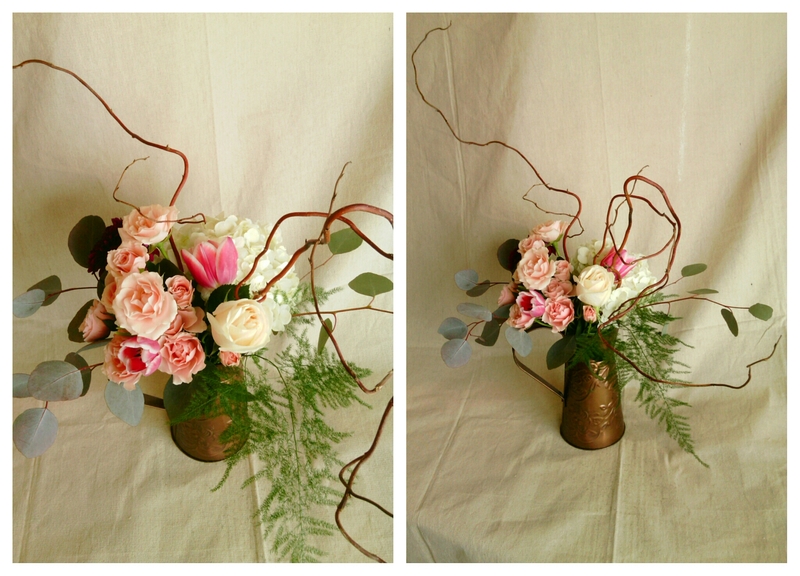 I usually always try to do a little something extra for weddings when I can. After all, it’s a celebration that happens once in a lifetime. 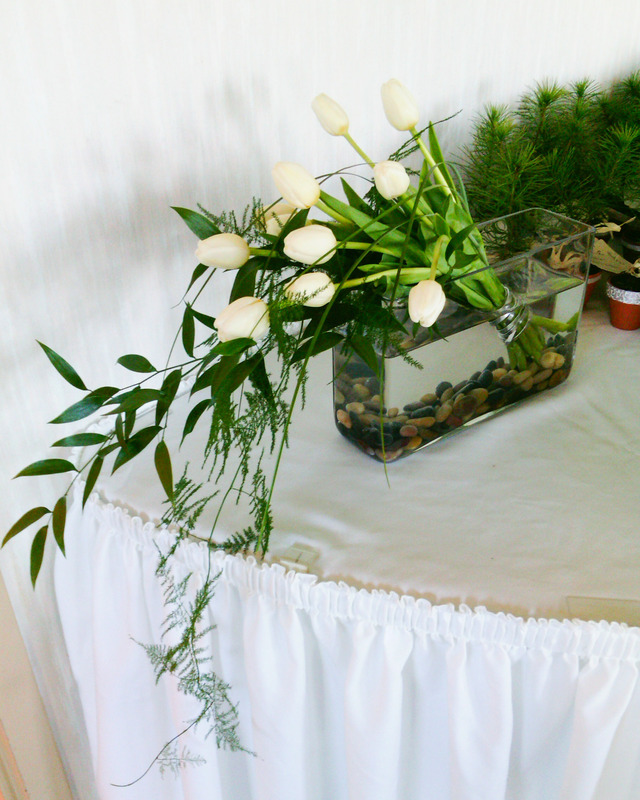 Why not do what you can to make this day extra special for the bride and groom? Marsala is a famous wine and gets its name from the city where it originates on the island of Sicily in Italy. It is believed to have been around since the time of the Romans and has been exported from that region for hundreds of years. The Rubino Marsala in particular has such a warm and romantic burgundy pink color, no wonder Pantone decided to name it their colour of the year for 2015! Originally sparked by Pantone, I have certainly been inspired by this rich colour pallet and history. 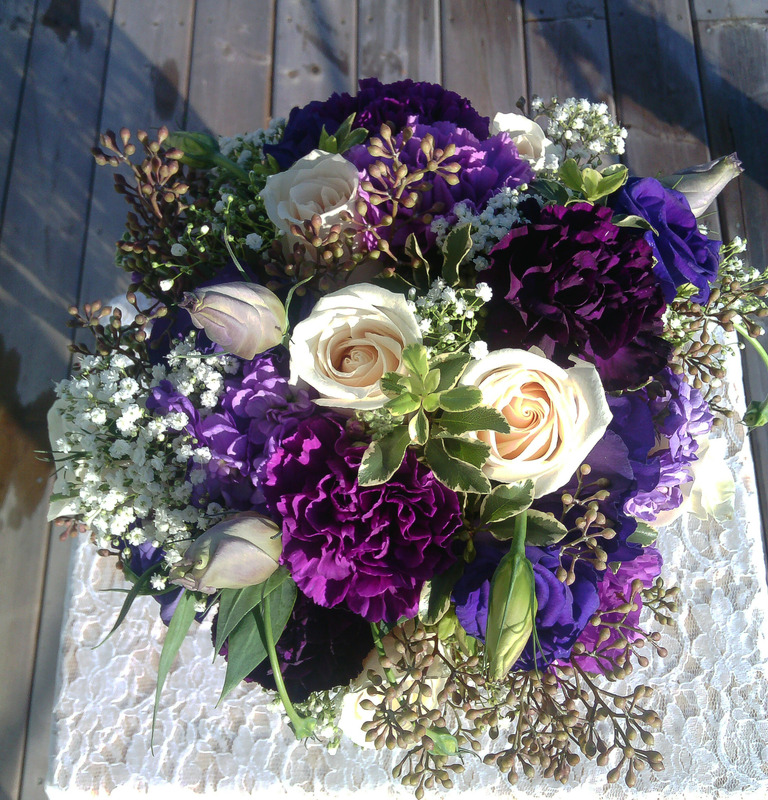 This was my decor theme for my booth at the Dazzle Me wedding show on March 29th, what a great colour for wedding decor! 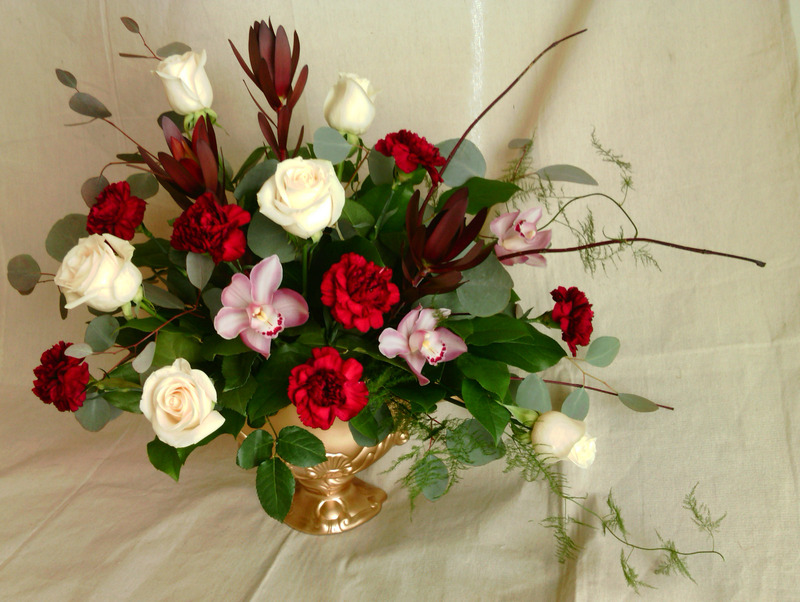 This Italian inspired floral arrangement has been created in a detailed gold vintage container and would be perfect as a wedding decor accent on your welcome table, gift table, or sweetheart table. Following a vintage theme, I re-purposed a second hand vintage inspired teacup set to create cute yet romantic wedding table centrepieces. 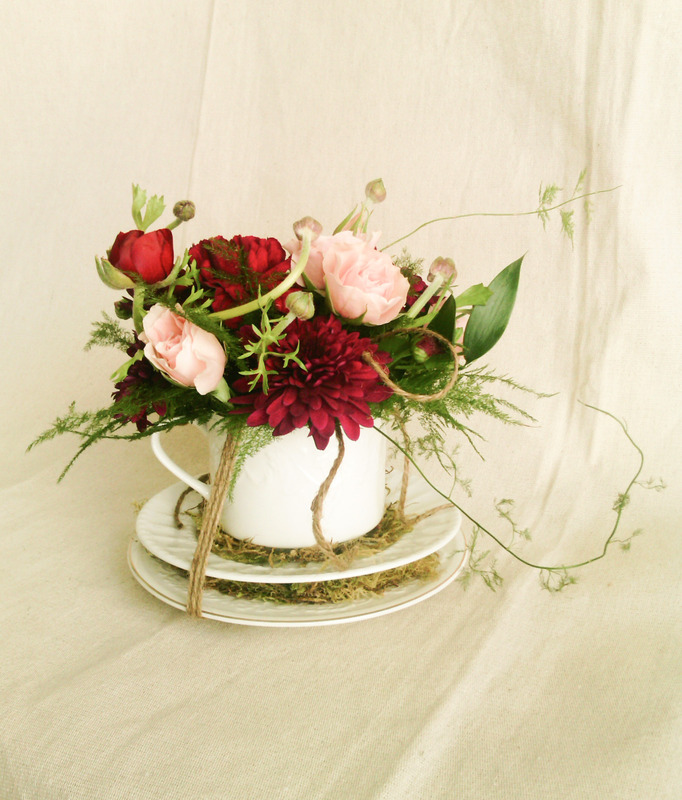 A copper pitcher full of flowers is accented with ‘Crimson’ curly willow branches to add height, interest, and a slightly whimsical and natural feel. 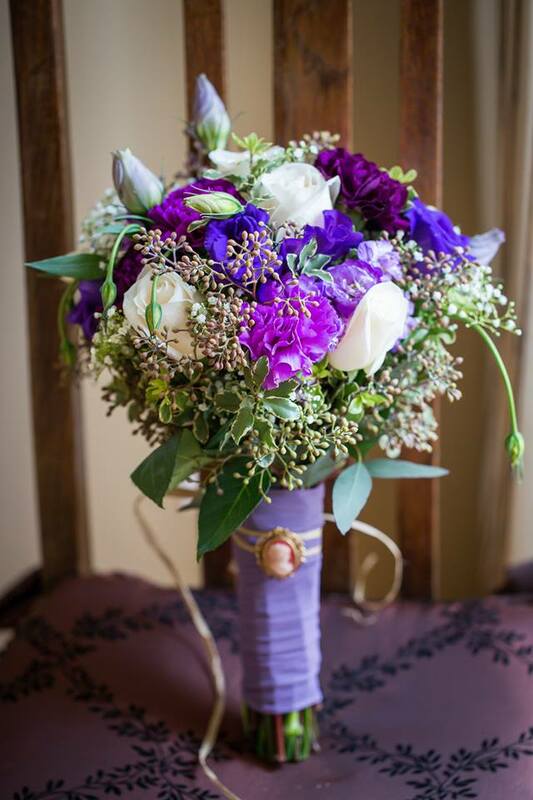 Loosely hand tied with trailing ribbons of various colours, this large wedding bouquet will certainly make an impact! 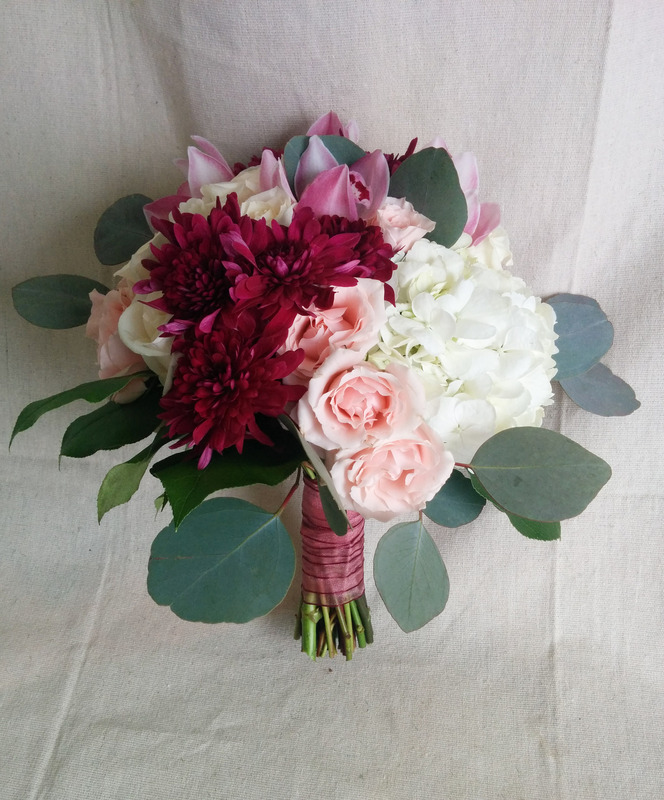 This wedding bouquet uses more pink hues from the marsala pallet and includes cymbidium orchids, spray roses, chrysanthemums, and hydrangea. 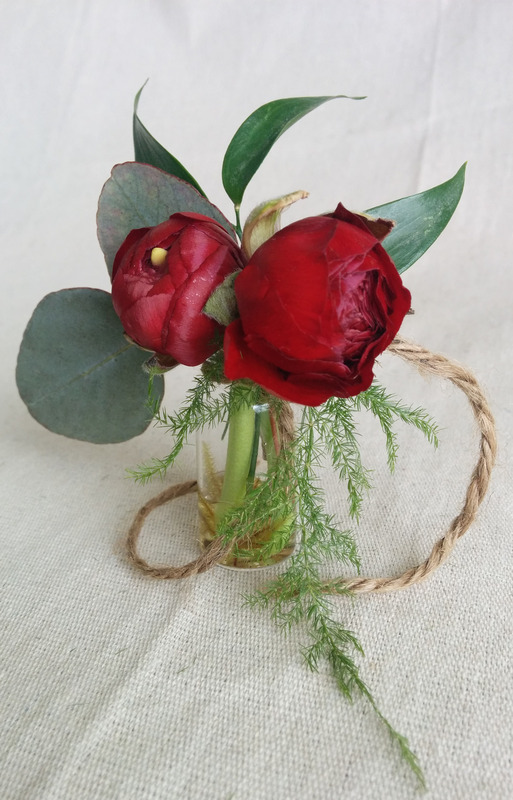 A boutonniere arranged in a miniature pin-on vase featuring burgundy ranunculus, twine and foliage. I don’t mind dedicating my weekends to my work or spending my entire evening on my business either! 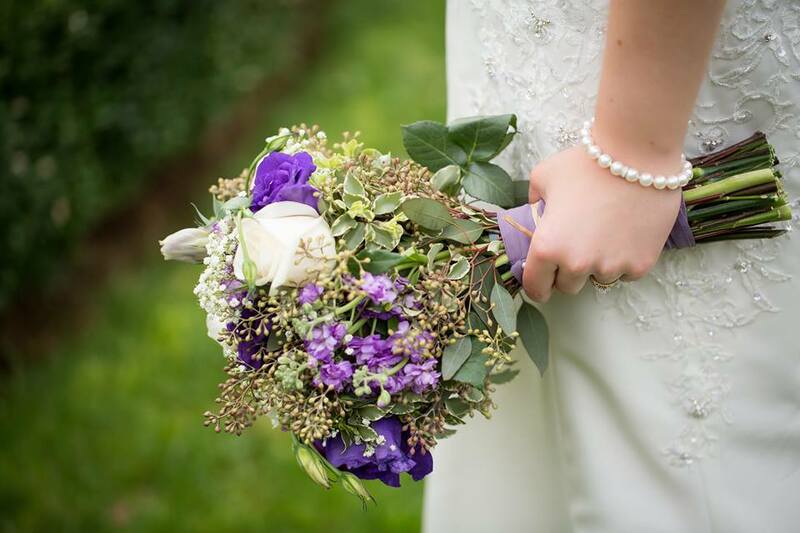 It’s just simply what I love to do, and there are no TV shows or personal Facebook feeds that could compare to the immense joy I get from doing what I love to do – being a wedding florist. I often find that new ideas come to me during sometimes rather inconvenient times. In the shower, in the middle of the night, while I am out for a walk, I just don’t stop thinking about my business. Whether that’s coming up with a new marketing plan or a new way to physically create my products, my creative wedding flower wheels do not stop turning! Have you also found your passion? I would love to hear about your stories! How did you find your passion? What is it that makes what you do so fulfilling? Leave your comments below. As an artist, I’m always trying to come up with new and interesting ideas. Whether that’s expanding on what I already know, coming up with new solutions, incorporating new ideas, or reinventing old ones. 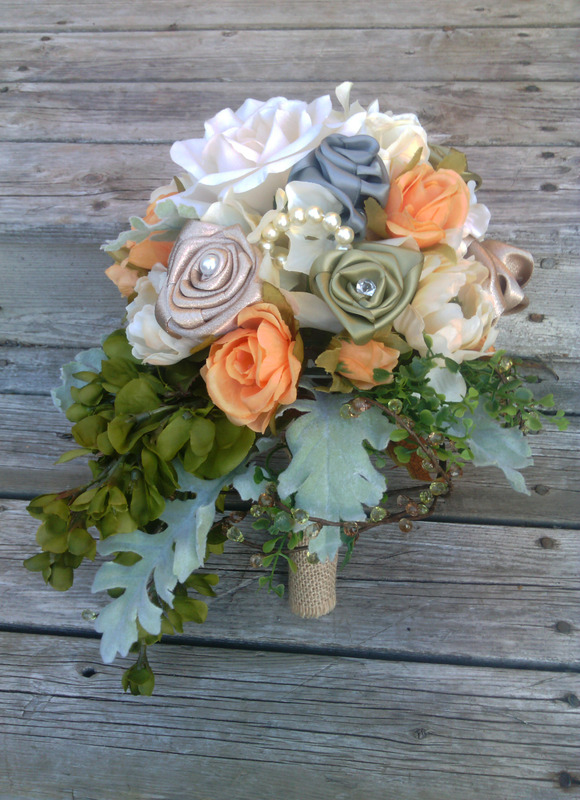 For quite some time I have noticed some inefficiencies in the usual wired and taped boutonniere. 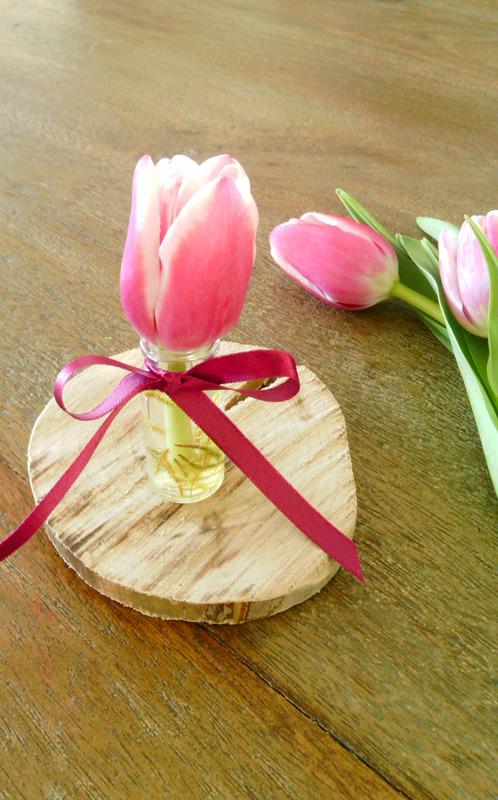 Mainly, this method leaves flowers and other fresh products without a water source, which is essential in keeping flowers fresh and looking their best. 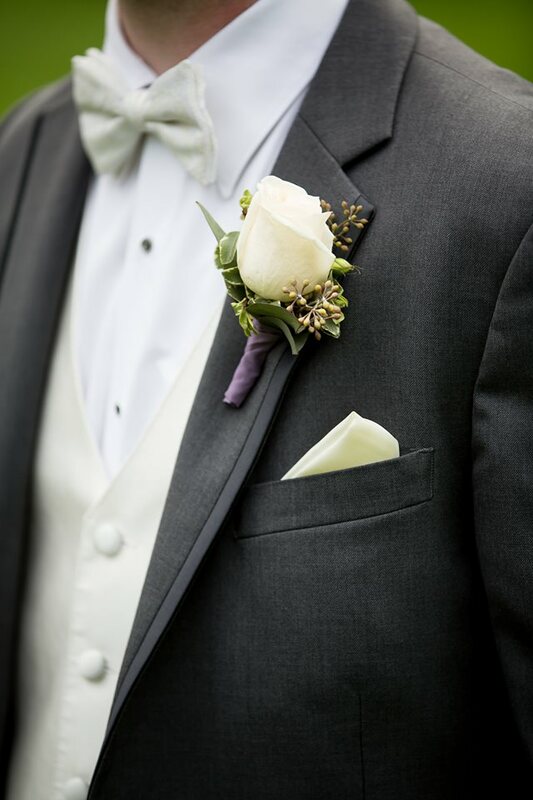 The other problem that the traditional method poses is that they can sometimes be difficult to pin on, especially if you haven’t tried to pin on a boutonniere in the past. 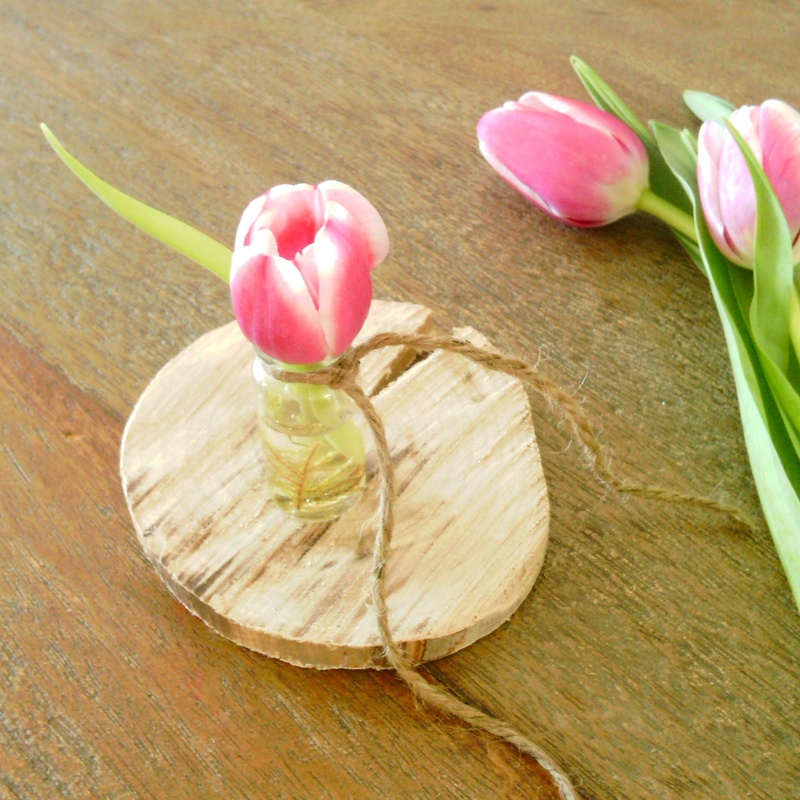 I became inspired by some of the terrarium necklaces I had come across online and on Etsy in particular. It’s funny, my professors at NSCAD always preached that art is a conversation. Artists will often come up with ideas sparked by another artists’ work, which will then often spark new inspiration for many other artists in the future, and so the global conversation continues. 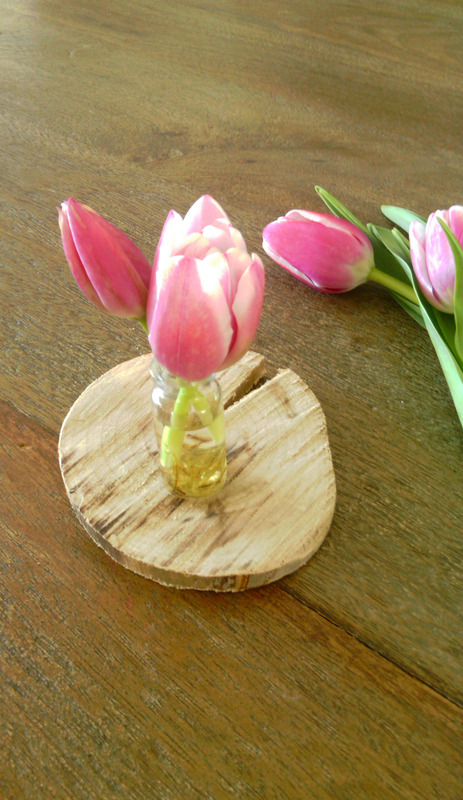 After admiring how cute and rustic those little terrarium inspirations of nature were, I thought, this could be something I could incorporate into wedding flowers. 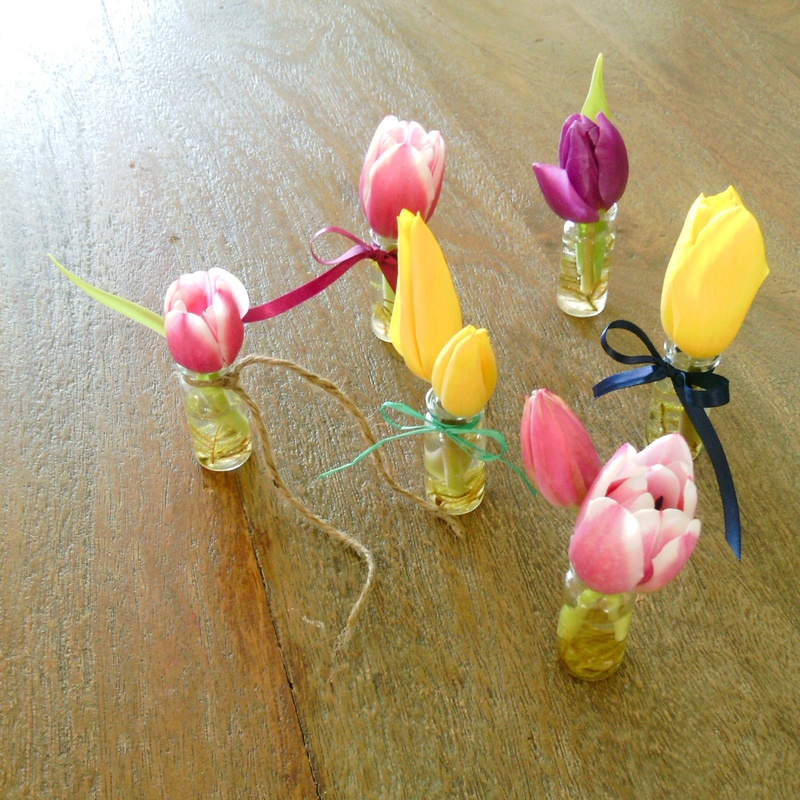 Finally a solution to the traditional style boutonnieres: miniature vase boutonnieres! 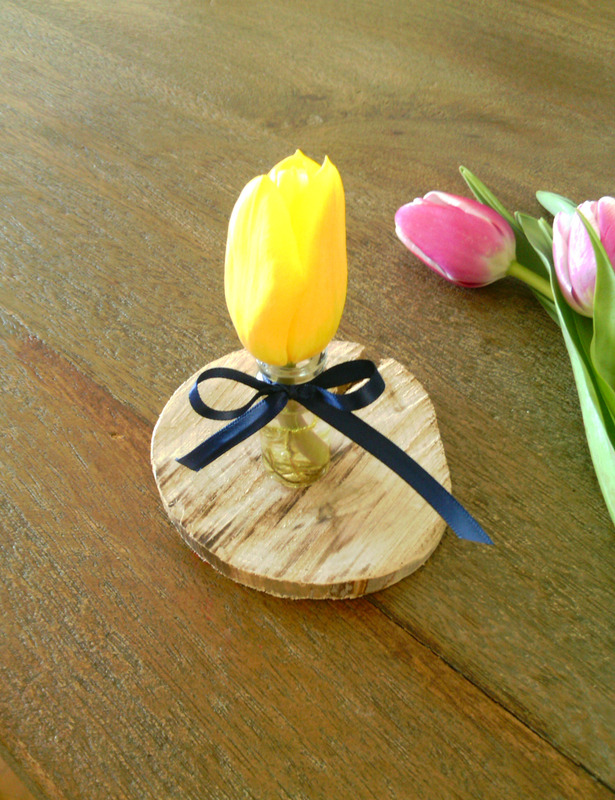 Simple, efficient, unique and quite pretty, these super cool boutonnieres can be made to match any wedding style, and are easy to attach to any lapel since they do not use traditional boutonniere pins. 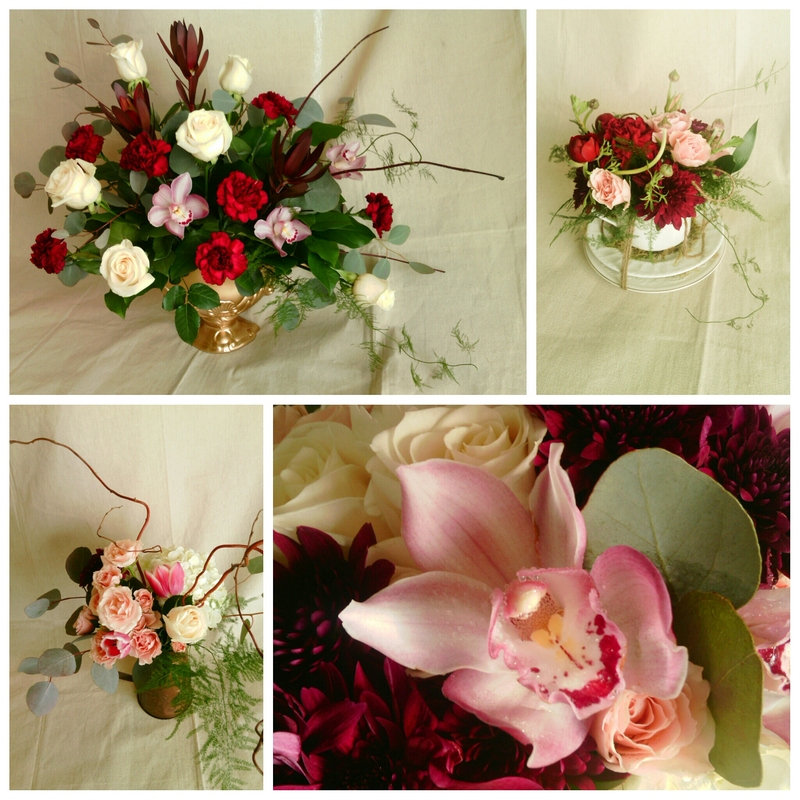 From cascades to orchids, lets make the wedding bouquet of your dreams come true! 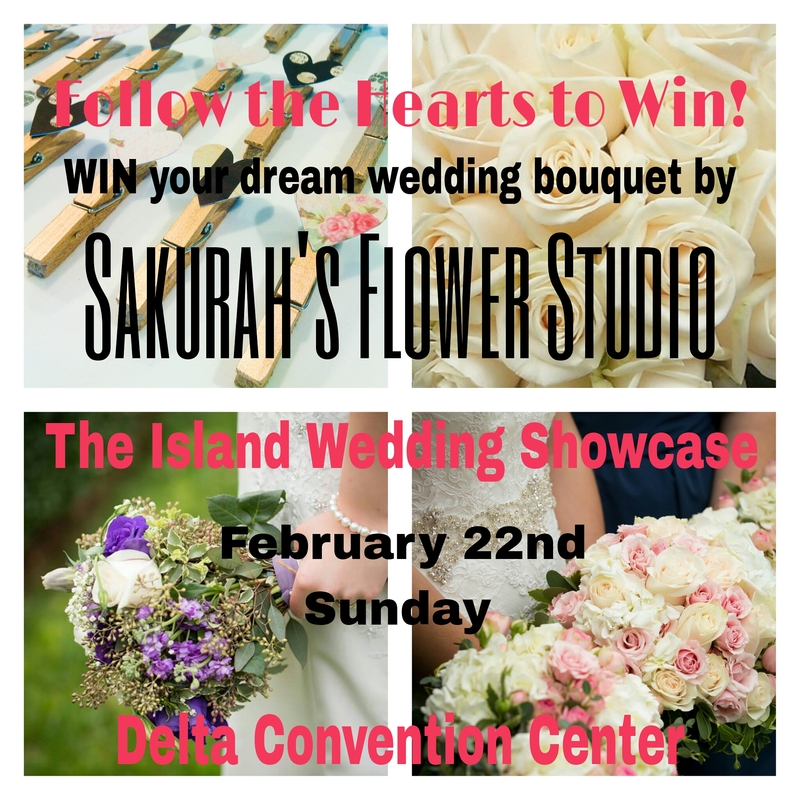 This Sunday, February 22 at The Delta Convention Center, Sakurah’s Flower Studio with be giving away a free wedding bouquet to the value of $250. 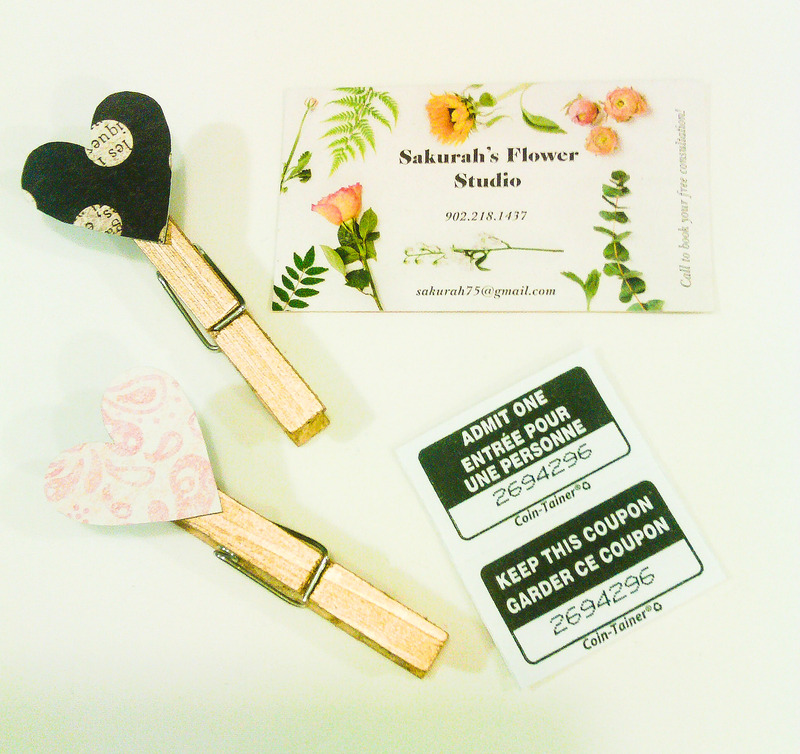 Each handmade Heart magnet at our wedding flower booth holds a ticket to win your wedding day bouquet to the value of $250, designed by Sakurah’s Flower Studio! 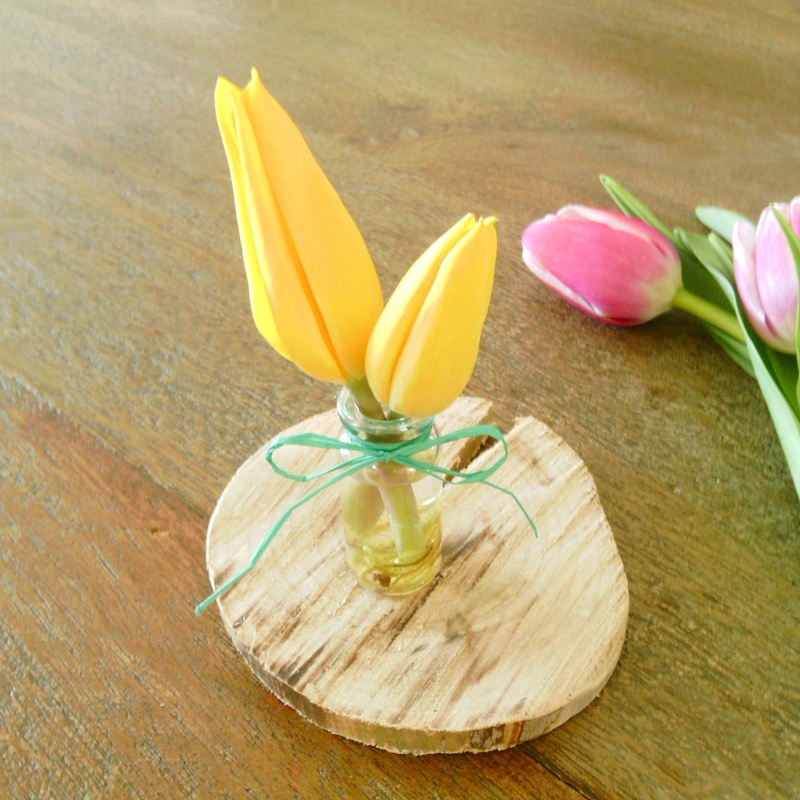 This epic give-away will only be available at the Island Wedding Showcase 2015. 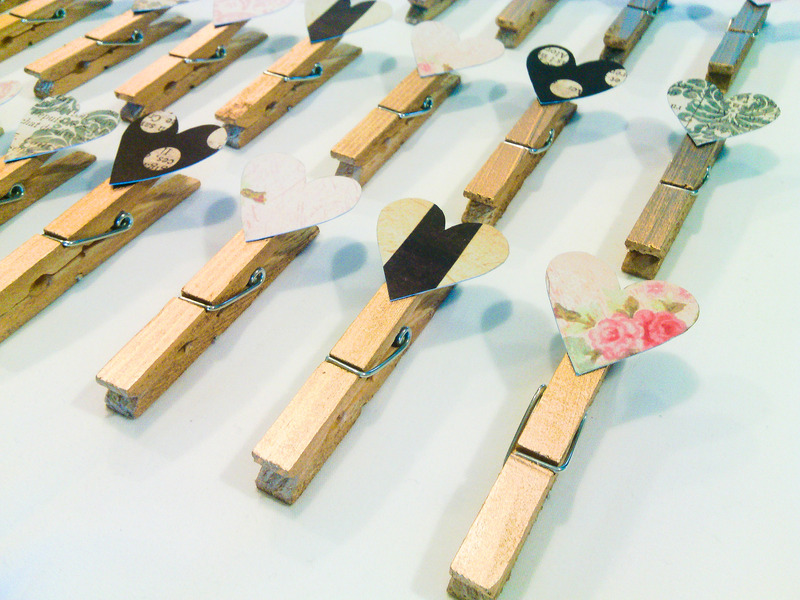 If you have wedding bells in your future, Follow the Hearts to Win! 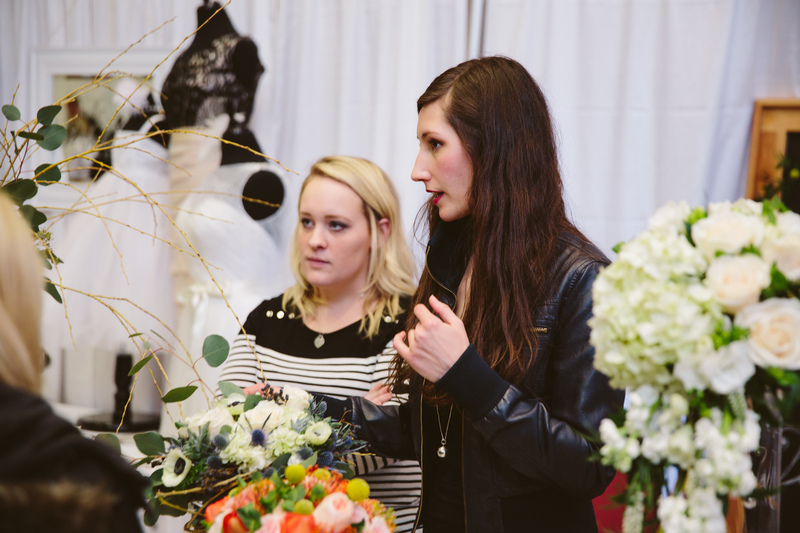 and don’t miss out on this amazing wedding event featuring a fashion show and wedding professionals of all kinds. 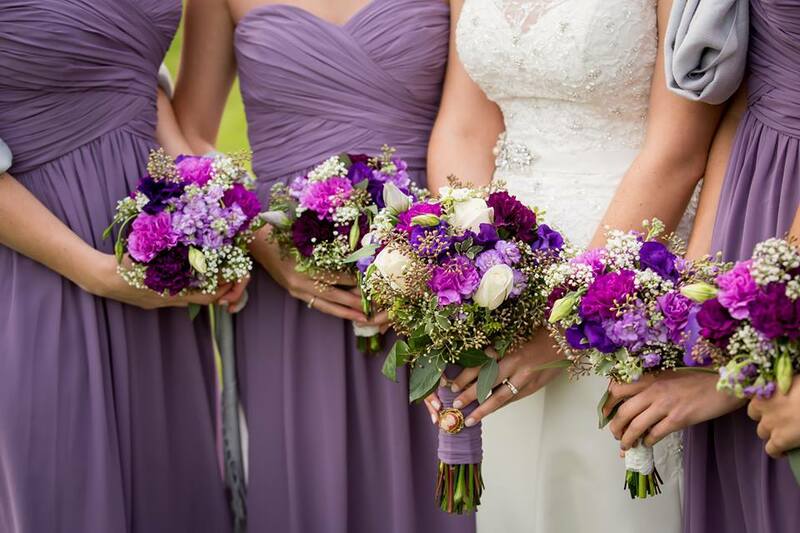 From dresses to flowers, reception rentals and DJ’s, this show has all you need! 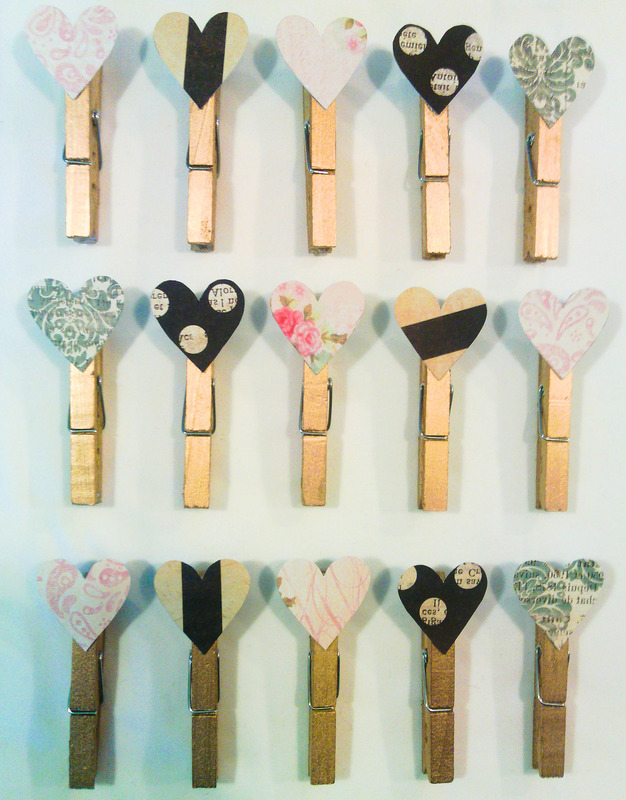 Love DIY? 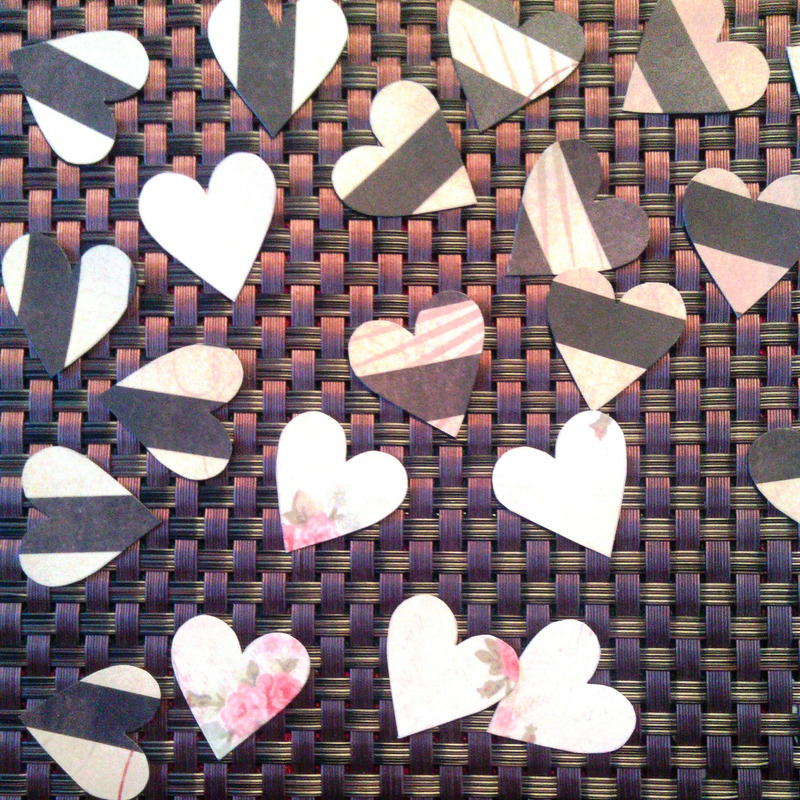 Check out how to create these cute Heart magnets here. *Some restrictions may apply. Please see our guidelines on Promotions, Contests and Give-aways on our Terms of Service page. 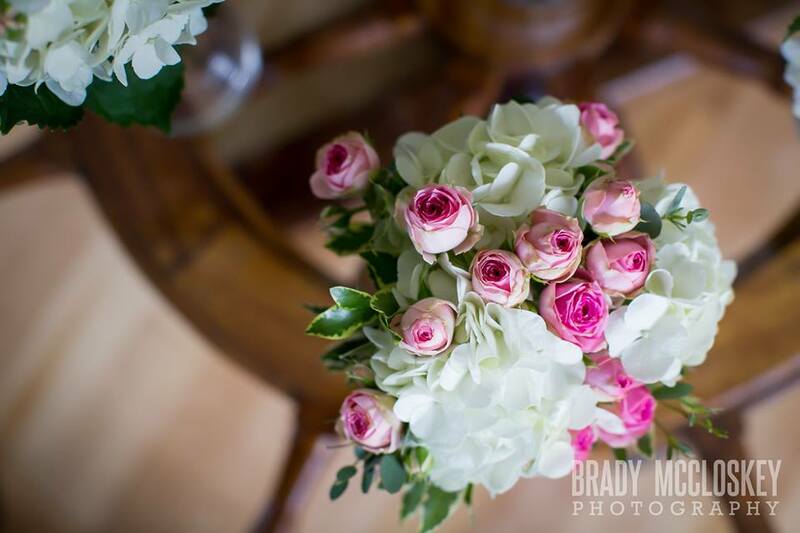 I just received some gorgeous photos by Brady McCloskey Photography from a wedding I had the pleasure of creating the wedding flower bouquets! 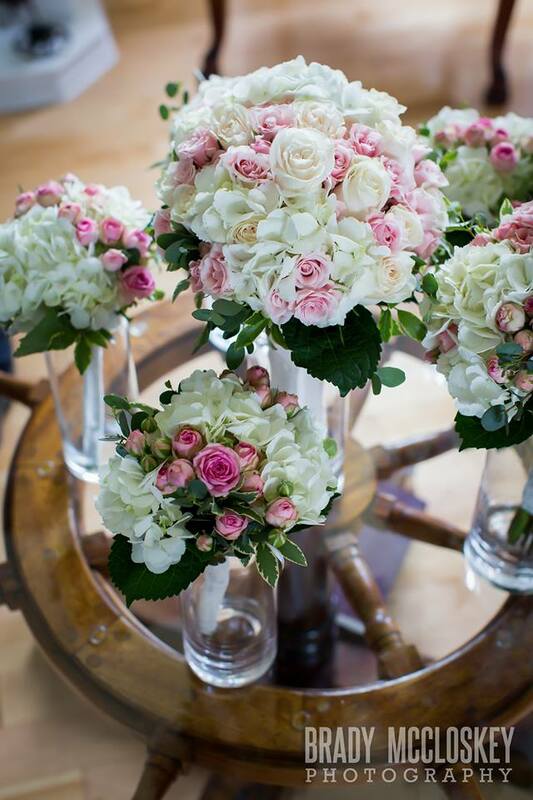 If you’re planning a wedding visit my Contact Page to book your free consultation. Read all about this Victorian inspired wedding here on my blog and be sure to check out Brady’s website to book your wedding, engagement or family photo session. Time to start pinning up a storm! 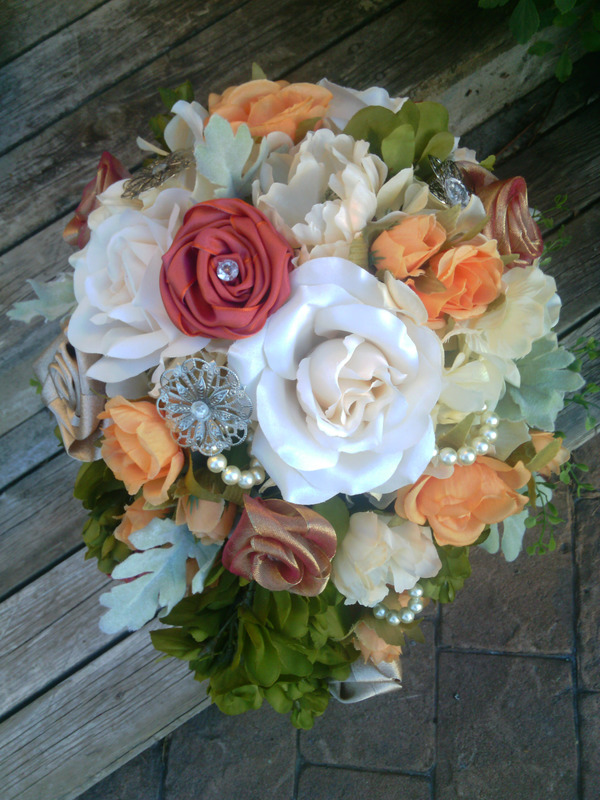 I met with the bride’s Mom, Dawn a few days ago to discuss flowers for her daughter Alyson’s wedding next year. 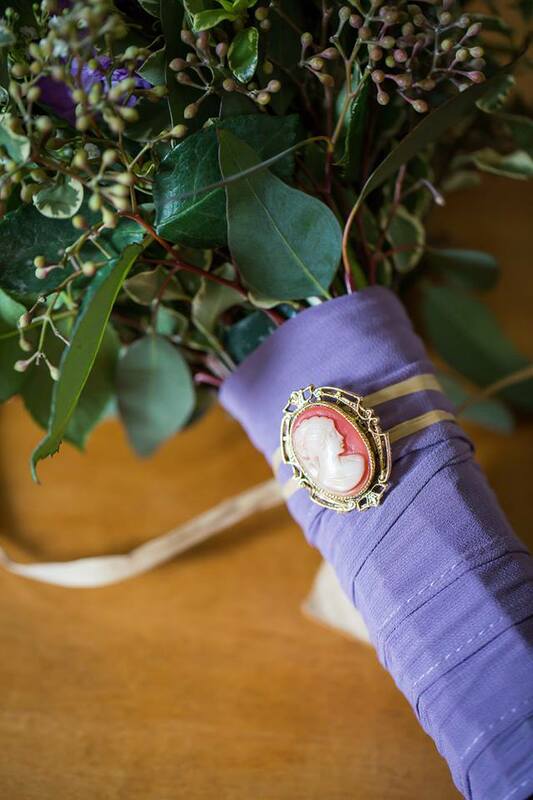 Dawn had handmade some silk flowers in different pretty coloured ribbon and wanted me to incorporate them in her daughter’s bouquet. I thought this idea was adorable! 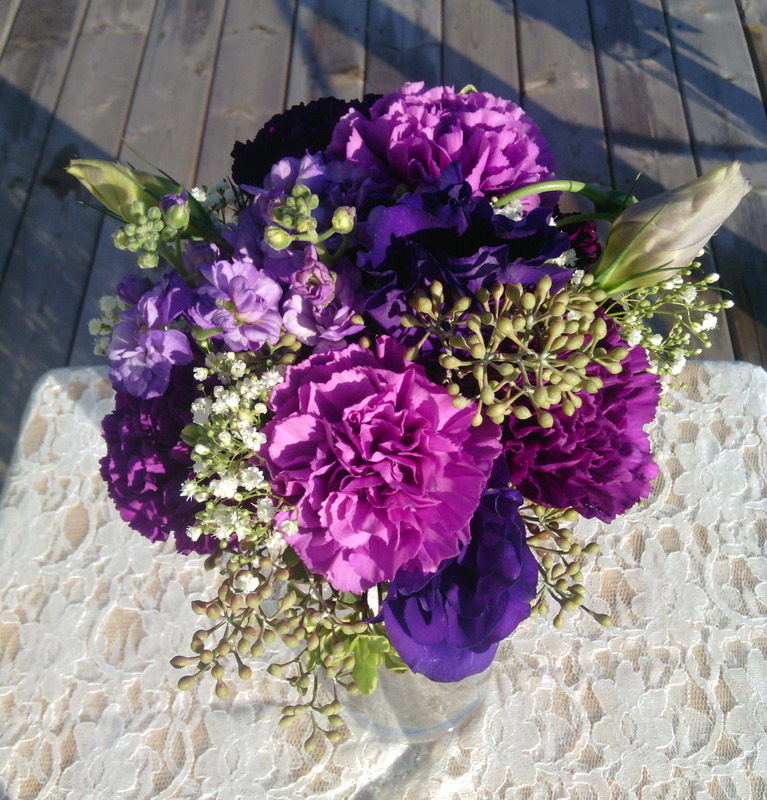 We decided on permanent flowers for the bouquets. 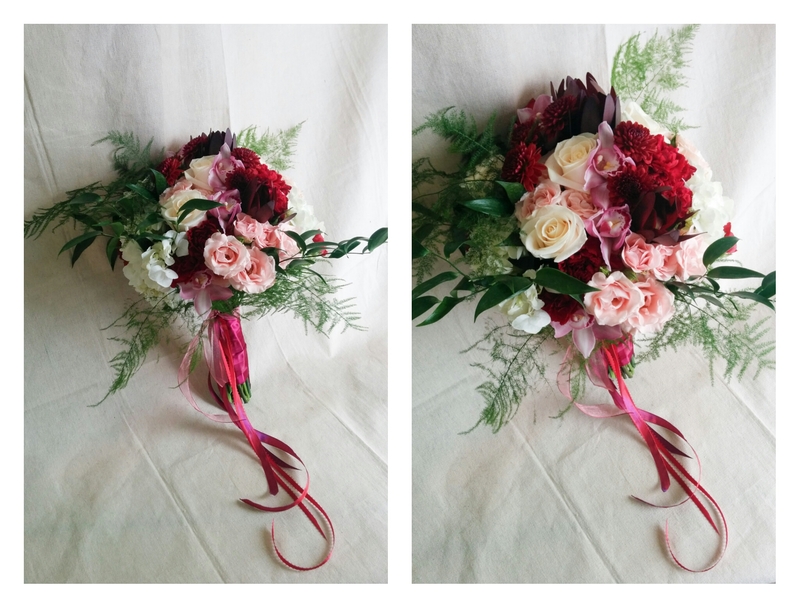 Not only did the idea of permanent flowers seem to best match Dawn’s handmade flowers, it also allowed her daughter to see her bouquets while she was home visiting her mother for Thanksgiving. 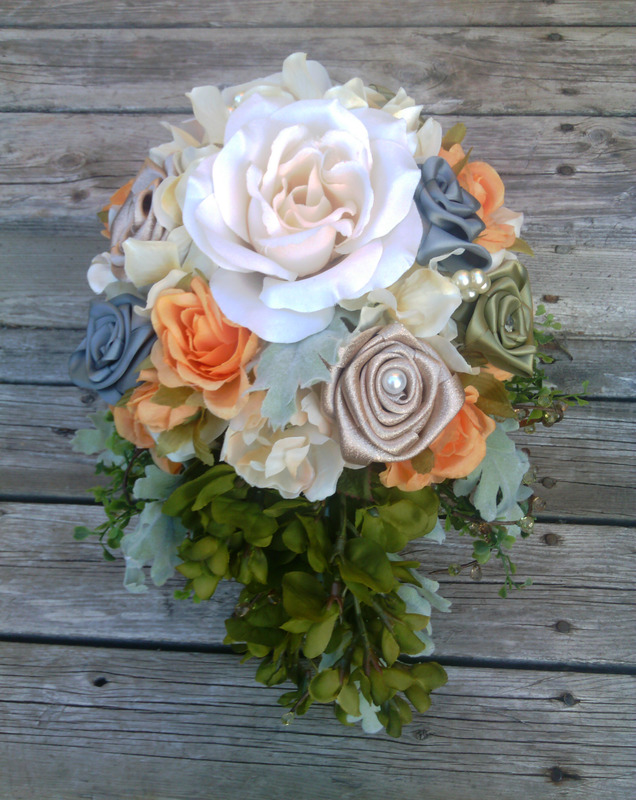 I set up a mutual Pinterest board that the three of us, Dawn, Alyson and I could use to exchange wedding bouquet ideas.The guidelines for me to work within included incorporating both a rustic and vintage feel, use fall colours with out the typical yellows and oranges, incorporate burlap, Dawn’s flowers and other decorative items she provided. Three days later I was at their door on Thanksgiving delivering the finished flower arrangements. 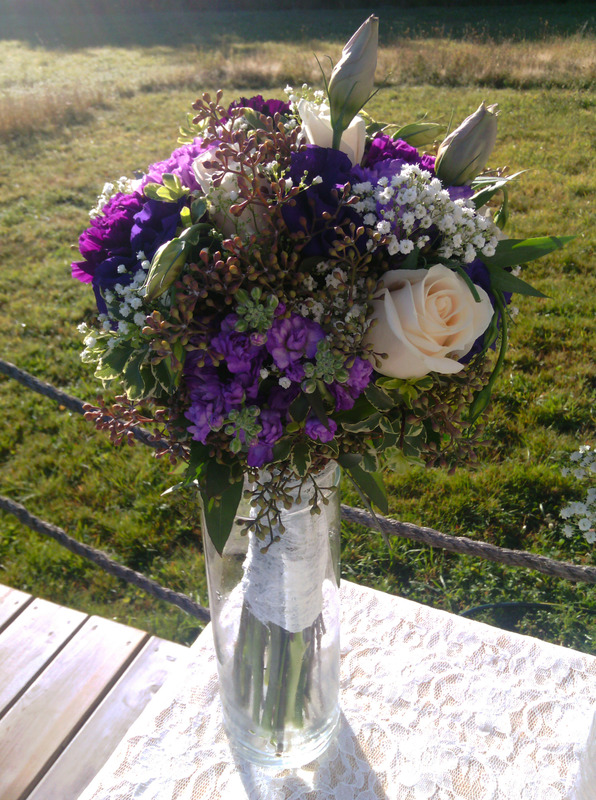 Alyson was absolutely delighted with her wedding bouquet and also loved the added flowers that her Mother had made! 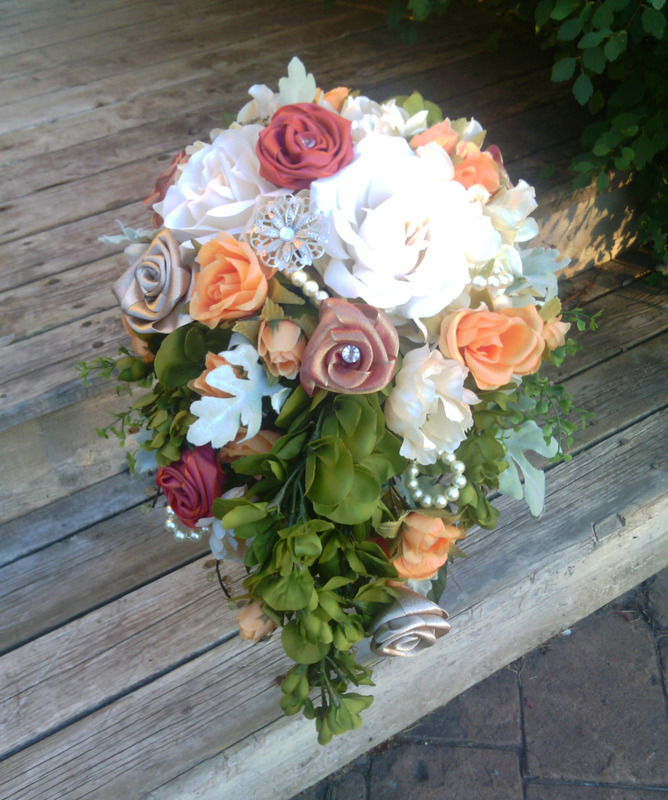 This past weekend I had the pleasure of creating the wedding flower arrangements for Martine and Nathan’s wedding. 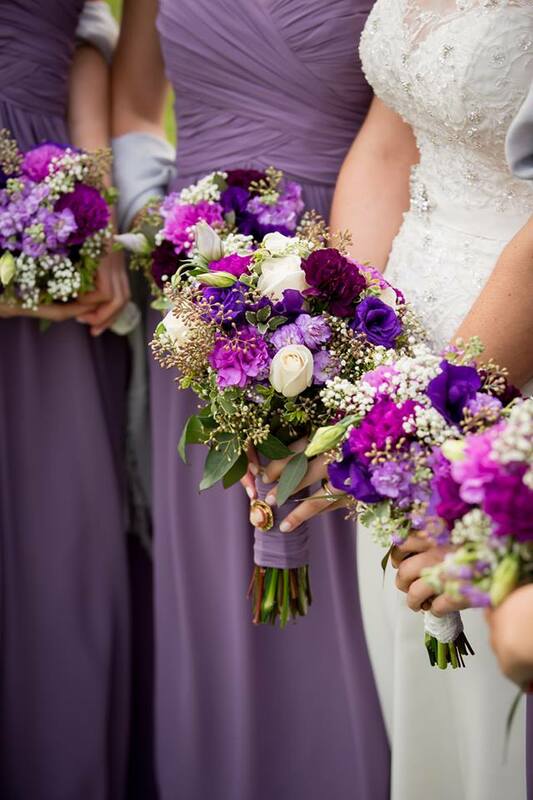 Martine’s main wedding colours were a mix of purple tones, accented with cream, pearls, and lace. I selected flowers based on both the theme and budget. 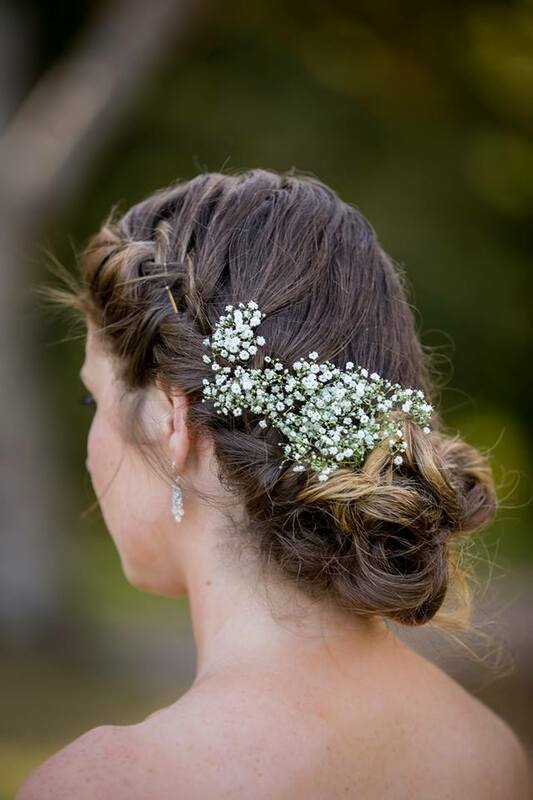 Immediately when I think of a Victorian themed wedding I think of ‘Vendella’ Ivory Roses, Gypsophila, and an elegant variegated greenery (I chose variegated New Zealand Pittosporum). 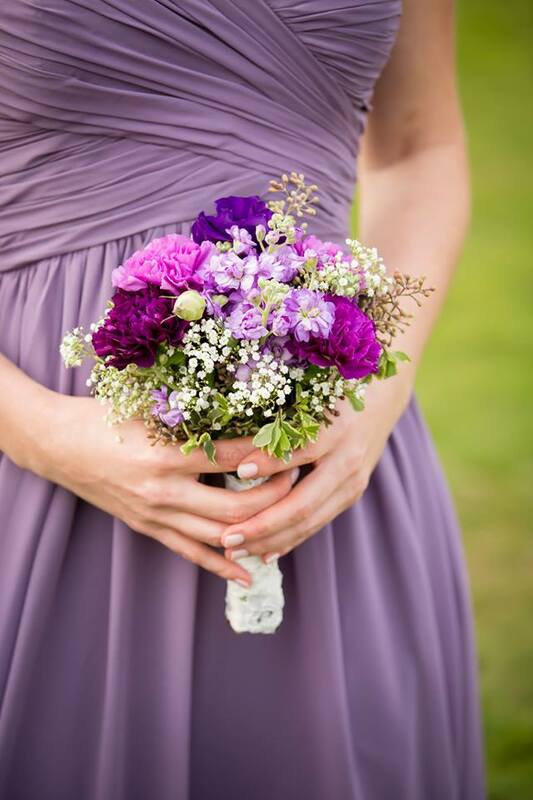 To achieve the hand-tied garden style she desired, I used purple Lisianthus, and to keep us on budget, I chose lavender Stock and three different purple hues of ‘Moon Series’ Carnations. She had also requested that I incorporate some kind of berry, so I went with seeded Eucalyptus. These ‘seeds’ are smaller and more elegant looking than other types of berries, plus the dusted blue tone of the leaves helped to perfectly blend the Victorian and fall themes together. Once my flowers arrive, the process begins! 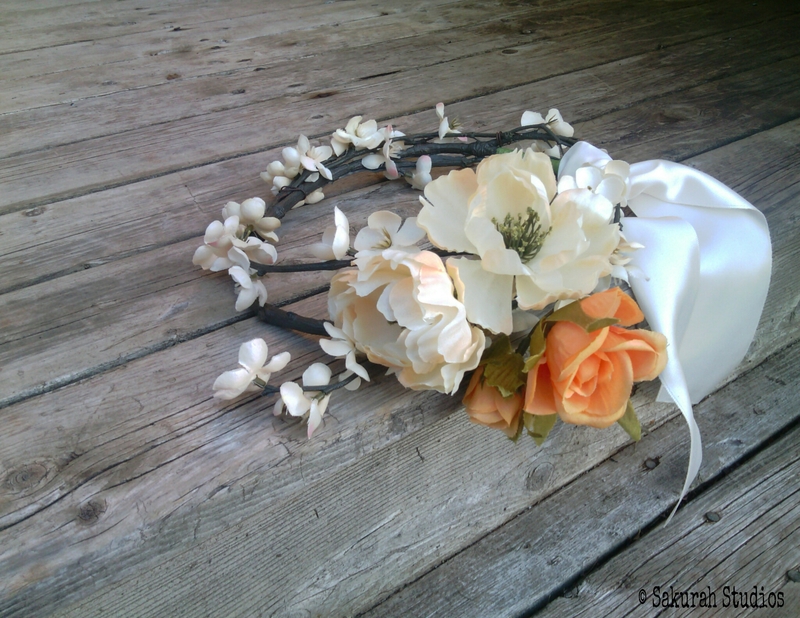 First, I cut each stem and start conditioning my flowers so that they’re ready for designing. 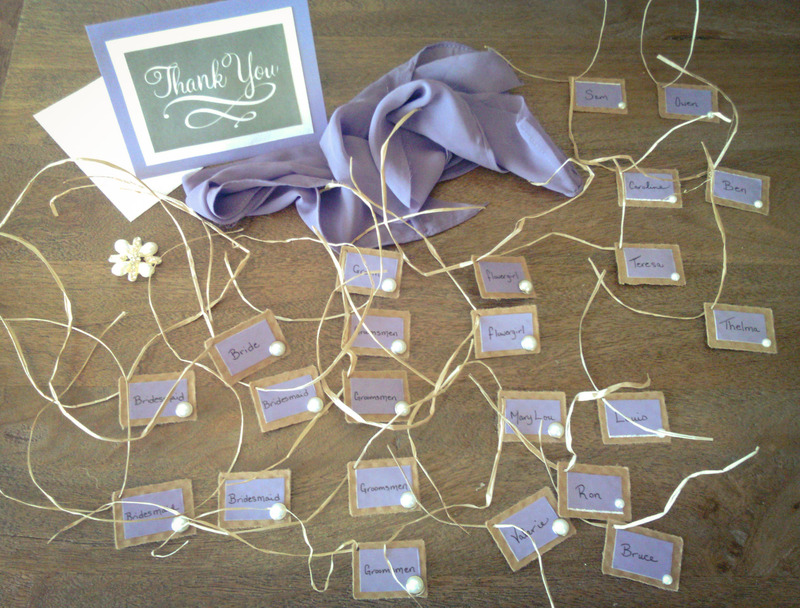 While I wait for the flowers to condition, I start to make handmade name tags for the bouquets and boutonnieres. For these, I begin with textured brown paper, which I hand ripped into small rectangles. 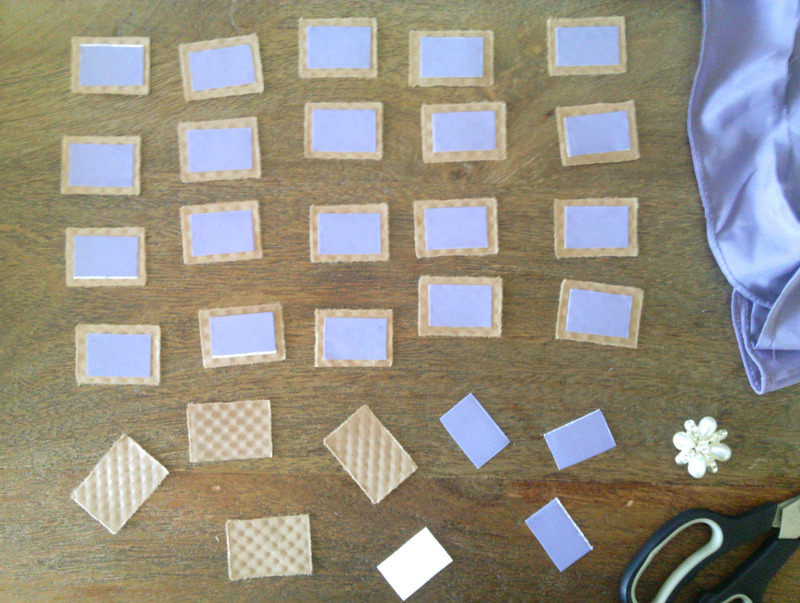 I then choose card stock that is in her bridesmaids dress colour, Victorian Lilac. 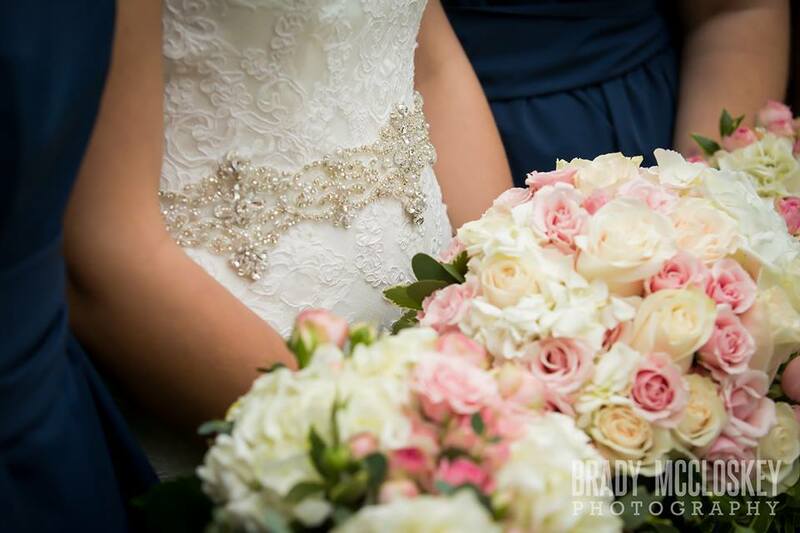 To dress them up, I incorporate the look of the detailing from her wedding dress by attaching small, silver encased pearls to each tag. Once the flowers have finished conditioning, I finally get to start making the bride and bridesmaids bouquets, my favourite part! Next I start preparing for the corsages and boutonnieres. 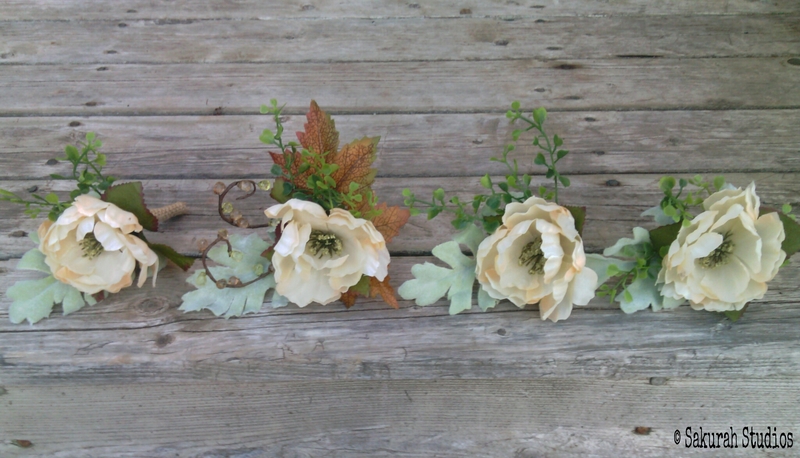 First I choose a corsage ribbon that will match the wedding, in this case cream, and create all of the corsage bows. 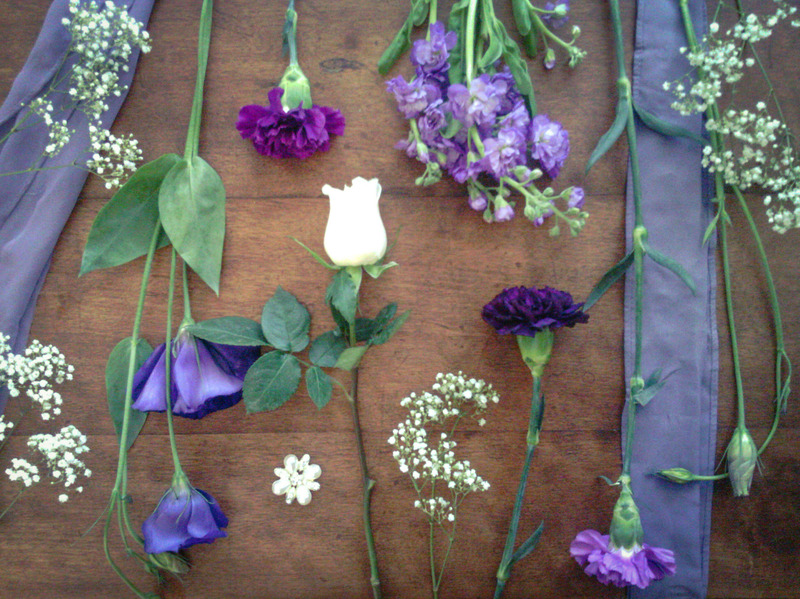 Then I lay out all of the materials for the first 6 corsages. 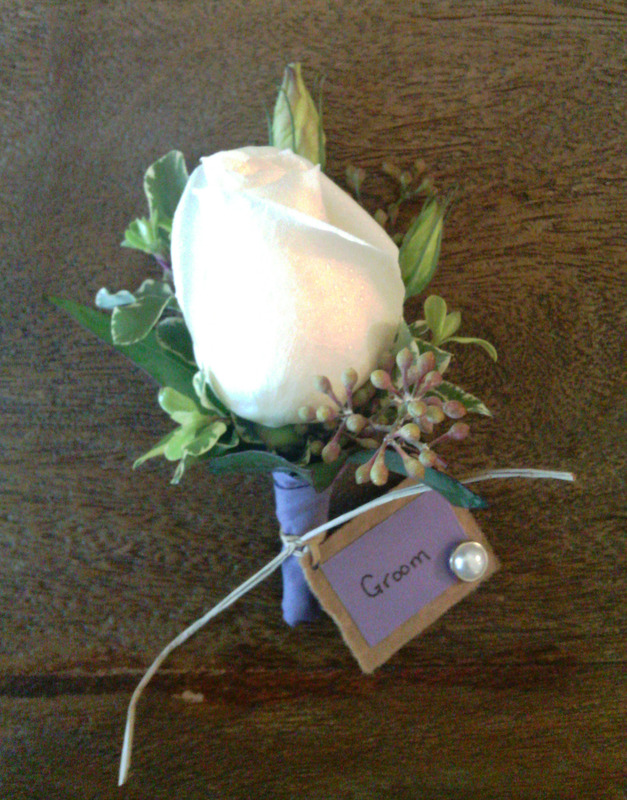 Next I make the Grooms boutonniere. 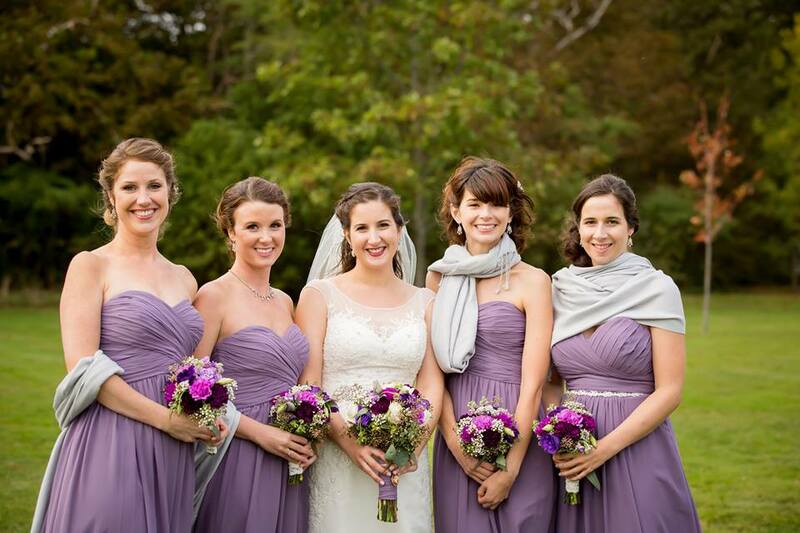 Martine asked me to incorporate some of the left over material from alterations to her bridesmaid dresses. 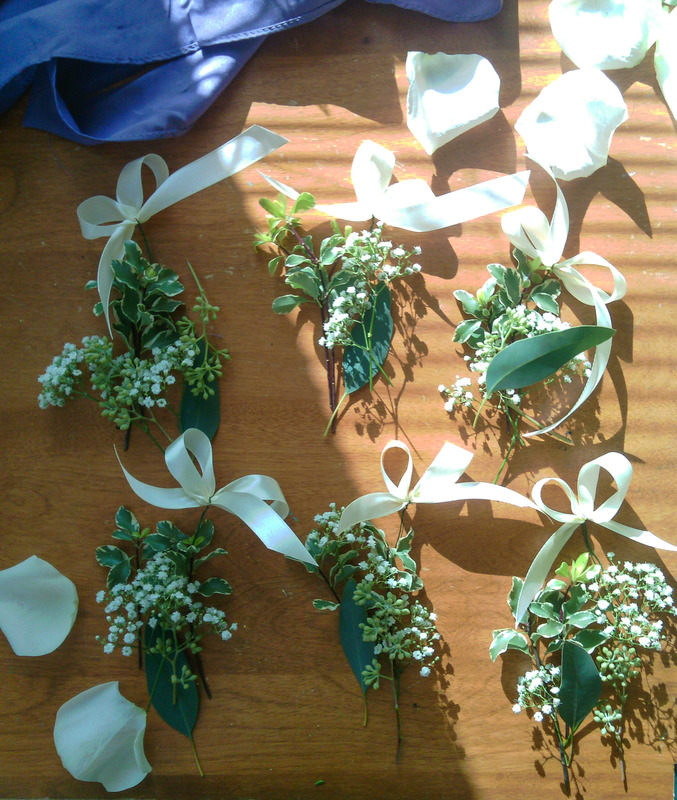 I gauged that there was enough left over to wrap the stems of all of the boutonnieres. 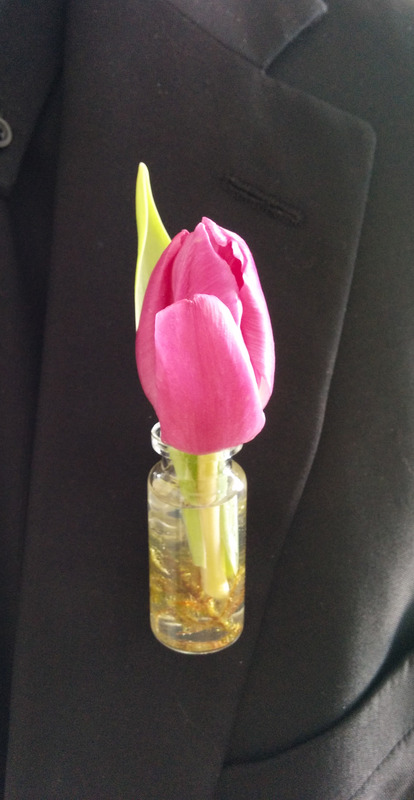 This allowed the groomsmen boutonnieres to match perfectly with the bridesmaid dresses. And here you go! Now you can view more photos here! !